Is Google+ the new Twitter or FaceBook? Could it be a replacement for Skype, Qik and Flickr? These are some of the big questions swirling around as everyone tries to wrap their heads around Google's new social network, Google+. As with all new social networks (Buzz, Plurk, Orkut, Friendster) I proceed with cautious optimism. I firmly believe that the key to any social network transition, is bringing your already-established network with you, and then increasing it further (if that is your goal). Point: if you can't bring your network with you, then you'll find yourself checking into multiple SNs, which will quickly grow tiresome. FaceBook has a huge advantage in that even older generations and self-proclaimed techno-phobes are using FB. I'm not sure I see a quick bolt to Google+ for these folks. Branding is everything. Google has landed the search term; everything gets "Googled." I'm thinking that FaceBook may have cinched the everything-related-to-social-networking term. I am comfortable with FB, understand how the privacy settings work and use them well. Today. Last week, FB changed my settings on me and I had to tweak them. Again. Too many other folks who use FB, are NOT as aware of the privacy settings as am I, and those in my social network, and frankly I'm tired of seeing and reading about very smart people shooting themselves in the feet because FB makes it too difficult for them to figure it out. Then again, NONE OF US are very good at chasing moving targets. Most of us are clamoring for something secure, clean and easy that could be a potential use in the classrooms. This looks very promising, and not sure what it would look like for the Google Apps in Education user but (Google are you listening?) if there is no possible way for teachers to moderate student comments before they go live, large U.S. public school districts will likely take their 19th century ball and go home. Jason Calacanis talks about Google+ in this week's episode of This Week in Startups, and recently wrote a post, "Why Google+ Will Take Half of The Social Networking Market From FaceBook (or There Goes Calacanis Again"). I recommend reading the entire post, but copied and pasted below just a portion of his post to share his top reasons why he thinks Google+ will totally rock. Here are my top reasons why Google+ will be a crushing success. When Larry Page took over as CEO, I sent him an email and told him that if Google was going to be taken seriously as a player in social, he needed to get a Twitter account and start using it. Leadership starts at the top, and Google’s leadership is, finally, taking social seriously. Notoriously press-shy Larry (how many interviews has he done since taking over as CEO? oh yeah, zero) sharing kiteboarding photos speaks volumes. Sergey is also posting, interestingly, action shots (a sky-diving photo). Google Hangouts is a 10-person, video chat product that’s fun and free. You can hangout with your address book in seconds, it’s rock solid and -- did I mention -- completely free. I could certainly see myself using this product instead of firing up Skype. If you didn’t know, Chrome now has 20.7% of the browser market. That’s from a cold start with the beta launch in September 2008. Google also has an app store that competes with the iTunes store and charges 30% to developers for apps just like Apple. However, Google only charges 5% for in-app purchases, while Apple holds the line at a very unfair 30% for in App purchases. That’s how Google like to do it: take your competitors revenue stream--be it Microsoft Office, Windows, Apple’s iOS or Apple’s in App purchases--and make them free (or close to free). Google gave Angry Birds away for free on Chrome starting on May 12. More than 1M folks downloaded it in the first 10 days. Boom. Browser market share = power. Facebook does not have a browser or an app store -- yet. You can be sure there are 50 developers somewhere on the Facebook campus working on one right now -- 100% sure. Let’s do some deep, deep analysis shall we? a) Apple has a mobile operating system but no social network. b) Facebook has a social network, but no mobile OS. c) Microsoft has a mobile OS but no social network (arguably, Skype is a dormant one [ http://launch.is/blog/l018-how-microsoft-spent-7b-on-skype-and-15b-on-a-facebook-k.html ]). d) Google has a social network and an operating system. Who’s going to have the best mobile social user experience? If you answered D, you are correct. Last week I gave the opening keynote for the fabulous Future of Web Apps conference in Las Vegas. If you’ve never been to a Carsonified event, I highly recommend it, as it’s filled with people who actually build stuff (as opposed to CEOs like me who simply take credit for other people’s work). During that keynote I asked how many folks used Facebook for photo-sharing. About 15% to 20% of the audience raised their hands. I asked how many folks used a new service like Instagram, Path or Twitter to share their photos, and 70% of the audience raised their hands. I asked how many people were using Facebook more now than last year. Almost no one raised their hands. The tech-savvy crowd has grown tired of Facebook and Facebook’s privacy games -- including the huge misstep of making facial recognition opt-out and not opt-in -- are starting to drive folks from the platform. What are your thoughts on Google+? Will you stay with me? So, I really have been attempting to focus on learning German and assimilating into my new homeland. For the most part, I've let Tweeting, blogging, wiki maintenance, etc. morph into an occasional pasttime. (Okay, I still FBed a lot, but many times it is to practice my German or further my understanding of what it means to be German and European) BUT . . . Google+ sucked me right back in. I do think that the potential for education could be tremendous. And, I agree that the current iteration of Google+ does force one to be much more deliberate about the visibility of their content. There are some really cool possibilities with the Hangouts and Sparks (with a little more customization) could potentially pull in a Google Reader like capability. I'd like to see what Google could do about connecting Docs with Google+. Like many others who have commented, Tweeted, blogged, Plussed (is that what we're calling it), etc. I think the idea of starting from the ground up and restructuring a PLN is refreshing. I also think that the nature of Sharing on Google+ (with the deliberate selection of Circles) will help to make the Stream content a bit more relevant for all users. My concerns are: 1. the possibility of users SPAMMING non-users by adding email addresses to Circles and 2. the media posted on Google+ follows the general Google TOS and allows for Google to share your media with other entities. Other than that, I have to say that I really like Google+ and truly hope that it has a better run than Wave or Buzz. (BTW, I don't really understand the purpose of the Buzz tab on the Google+ profile pages). Thanks Lee for the info....have been hearing alot about google + so this was good info for my fact finding mission. Someone said they would send me an invite, so I will try it out soon......Thanks again! Thanks so much, for that very informative update on Google plus. Funny, my family and I tried a circle online network (can't remember the name)years ago, but, of course, no one really wanted to go online. Thanks for your take on Google+ as well as Jason's review. I was very excited about it after listening yesterday (Sun 7/3/11) to the podcast This Week in Google that was all about Google+. Keep us posted on your findings! I am eager to try it with my EDM310 preservice teachers. I am SOOOO glad someone like Google is taking on Facebook. I left Facebook over a year ago. I don't find it a helpful networking tool. I only see it as a place where I can give up everything to the almighty Marketing gurus. I got tired of having to search the depths of the account setting to find out where I could turn off the faucet. I'm more than ready to move to Google+. And, as you quoted in the article by Jason Calacanis, the Tech Savy have already started moving away from Facebook. I have heard grumbles even from the non-tech savy. They don't like Facebook, but see it as the only game in town. If Google+ is half as good as it sounds, I think people will be making the shift in droves. I am an EDM 310 student at the University of South Alabama. This week Dr. Strange assigned me to follow and comment on your most recent blog posts. I am so glad that he did! 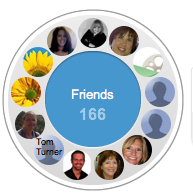 Google+ is the "talk" of my tech savvy Facebook friends. All seem to be genuinely excited about its potential (or are still whining about not getting an invite). Free time to learn more about Google+ has been impossible lately, so "Thank you" for giving me a better understanding. It is all very intriguing. I am especially interested in your eighth point (potential use in classrooms), and your informative observation that, "Before you share anything, you must choose who to share it with." I look forward to your next update on Google+. I'm going to disagree with you on one of your thoughts. I don't think you have to take your network with you and then expand on it. For me, I'm using G+ to narrow down my network. I have the chance to start over and reorganize people so that I can communicate and learn better. Certainly I've taken my network with me, but not all of it. My plan for using Twitter, FB, and G+ will now be more focused. FB for friends, G+ for professional stuff and Twitter for a combination of both. Whether or not this works or continues over time, I don't know, but that's where I'm starting. IMCGuy makes a good point. That helps me shape my thoughts about what tool to use and when to use it. Can anyone send me an invitation for Google+. It sounds intresting and after reading your blog am curious. I haven't used Google+ and so I don't have an opinion of it one way or the other. It will be interesting to see how Google+ does play out and how Facebook competes against it. Facebook seemed to take over myspace. I hardly ever hear of anyone who uses myspace. It will be interesting to see a few years down the road if Google+will do the same to Facebook.